Most vintage clothing and textile collectors have a box containing bits and pieces of damaged clothing, fabric and linens; scraps that were once a part of an era gone by, therefore too precious to discard. Often remnants of a vintage quilt are part of this hodgepodge of textile leftovers. An old quilt brings to mind images of a long-forgotten fireside craft and is recognized and valued for the skillful artistry of decorative needlework. Most vintage quilts represent a human story, with life histories meticulously hand-stitched together in colorful fabric blocks. Old quilts in rough and worn condition can be recycled into beautifully crafted throw pillows, by those who how to make pillows, that preserve the labor and effort of the original quilter. All that is necessary is pinpointing a salvageable section or square and remaking it into a bright and colorful throw pillow for a sofa. Hand-appliquéd vintage quilts overflow with an abundance of colors and patterns so it is easy to integrate a snippet of the past into any décor, especially a shabby chic and country cottage design. Victorian crafts can add a unique perspective to any decorating space. Throw pillows with a bright splash of color from a reclaimed quilt add a delightful touch to a little girl’s room, nursery, sunroom or porch. Everyone knows just how long quilting takes, just how laborious it is, with beautiful and skillful handiwork hidden away in the folds. 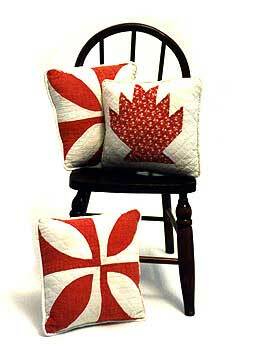 Use a pattern, like "Ten Great Pillows", to easily recycle vintage quilt scraps into charming, quaint and colorful throw pillows. Quilt making was a form of decorative work in which many women took great delight and became astonishingly skillful. In the past, women reveled in intricate and difficult patchwork; they eagerly exchanged patterns with one another; they talked over the designs, and admired pretty bits of calico, and pondered what combinations to make, with far more zest than women ever discuss sewing and needlework together today. The ingenuity exercised in the design of a vintage quilt can be preserved and appreciated again even if the original object is in tatters. 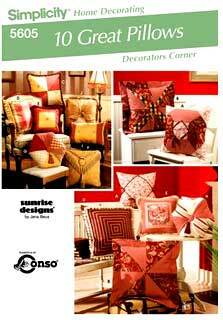 Any salvageable quilt square can easily be recreated into bright and colorful throw pillows. When stuffed with the appropriate pillow insert, trimmed with cording, ribbon and buttons, the new throw pillow will be a one-of-a-kind treasure. It is easy to make shabby chic looking throw pillows even if you do not possess a box full of quilt remnants. With the vintage quilt block patterns from 1913 shown below, you can re-create thirteen authentic designs. 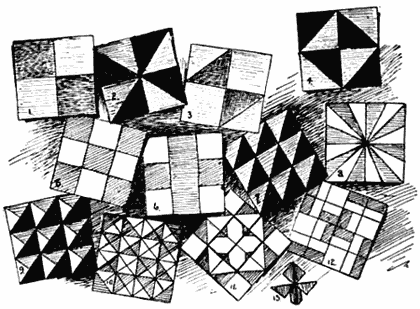 Each square is numbered accordingly: 1) Four Block; 2) Triangle or Wind Wheel; 3) Hour Glass; 4) Double Hour Glass; 5) Nine Spot; 6) Cross; 7) Half-Square; 8) Star; 9) Pyramid; 10) Small Triangle or Cut Glass; 11) Rosette; 12) Wind-Mill; 13) Sego Lily. For the skilled needle-worker, there is a free pattern for throw pillows to make motifs from a 19th century patchwork design. This design in patchwork was originally made of gold and maroon colored satin, but any fabric color and texture to match your décor can replace the original. The pieces are lined with paper muslin before they are embroidered. Use light blue floss and a shade darker of maroon on the maroon blocks and on the gold.